Long-term hydrolytic stability is crucial for many polymers to be used in aqueous environments, e.g. for coatings with anti-fouling properties. While this is generally not verified (at best assuming tacitly that the stability of polymers is similar to the one of low molar mass analogs), we demonstrate that the stability of methacrylic polymers is much higher than the one of their monomers. In our investigations, we synthesized a set of polymers that are typically used for low-fouling coatings (such as non-ionic poly(oligo(ethylene glycol) methacrylate) and zwitterionic polysulfobetaines and -sulfabetaines. We studied their hydrolysis resistance upon extended storage in aqueous solution at ambient temperature in various pH regime by 1H NMR. 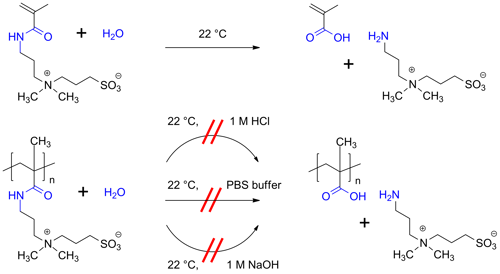 Whereas the monomers suffered slow (in PBS, pH=7.4) to very fast hydrolysis (in 1 M NaOH), the polymers, including the ones containing ester groups, proved to be highly stable. No degradation of the carboxyl ester or amide moieties was observed after 1 year in PBS, 1 M HCl or in sodium carbonate buffer of pH 10. This demonstrates the basic suitability of such polymers for anti-fouling applications. Poly(sulfobetaine methacrylamide) proved even to be stable for 1 year in 1 M NaOH without any signs of degradation. The excellent stability is ascribed to a steric shielding effect. The hemisulfate group in the polysulfabetaines, however, was found to be partially labile.